This is the month that we moved house & if you thought I was “boy-mad” before, just follow me over the next few months to read about my boy antics at my new school !!! Hi ya ! It’s Saturday evening. I’ve got really, really great news. You know Cathy, she asked Lee if he’d go out with me again. But, he said “no” and wouldn’t give a reason! Something he did say though, was that he likes me as lot and still wants to be good friends with me. He was really nice. He kept winking at me and he even got up from his own seat and came to sit next to me. We, Cathy, Me & Elaine, went in Ray & Lee’s tent until 3.00am. At first, they all came in mine, but Tom told us to get to bed. Cheek! Dear Me, It’s the end of our little holiday! I’ve been with Marina, Ray & Lee part of the day and Elaine, Cathy, Trevor (that tasty boy) and his friend, Dave, the other part of the day. I still luv, luv, luv Lee. And what’s more, I’ll never go off of him. Hi ! Guess what? You know Paul S. (boy down the campsite who lives in Rainham). Well his Mum and Dad were crowned Miss Kelvedon and Mr Hatch at Whitsun. My Mum and Dad got a letter from them this morning, thanking them for a great weekend. We went back to school today. It was alright. It’s funny how I’ve decided I like a couple of my old boyfriends again. Like Lee and Stuart F.
I went to a dress party tonight, but there wasn’t anything much good for me. By the way, I wrote to Dave, asking if what Elaine said, was true or not! Hi ya. I fancy Stuart F. again. Today in school, I was talking to him. He had this little photo of himself and I asked him if I could have it. He said “no”, but I keep on asking him. Me and Sue went round by his house tonight. Then, over the park, we met his little sister. I told her about the photograph. My Mum spent £8.35 on a skirt and top today. The skirt is high-waisted, past my knees, white with navy flowers on. It’s also flared. My new top is matching, white with navy edging and little buckle things on the sleeve. Watcha! It’s been another great day. At dinnertime, Me, Susan, Christine and Julie S. were sitting on the field talking to Stuart F.
Roubettes, Gary Glitter, Cozy Powell, Sparks, Ray Stevens, Cilla Black and Bad Company. It was quite good this week. Hi ya ! I’ve had the most fantastic evening ever with Sue & Julie S. You see, we walked to Elm Park and Derek B. and his mate was there. They kept following us and we kept following them. Anyway, we walked all the way home and they were behind & in front on their bikes. As we got to Elmer Gardens, I called out to Derek. He came over and kept smiling. We walked down to his house (with him following on his bike) and he actually said “see ya” and smiled. I’m absolutely in love with him. (It’s a shame we’re moving in 3 weeks, but I can still write and ring him.) Lovesick, Me. Hi. We went to a wedding today. It was really good (except for the crappy band!) The Groom had a brother called Keith who was 20. (Well, he had 5 brothers and a sister actually!) This bloke, Keith, was the funniest bloke I’d ever met. His birthday’s on 22 nd March, so I gave him my “Aries” ring. He was wearing it. I can’t stop thinking about Derek B. He’s just gorgeous. I’m not going to our new house tomorrow, but I’m gonna go out with Julie S. and Sue. We’ll probably go round Derek B’s house. I love him. Dear Me, I went round Sue’s this morning and we rang Derek B. up to ask if he’d come out. He actually said “yes”. So we met Julie S. and walked past Derek’s house. He didn’t come out, so I rung him again. He said that he didn’t want to come out. I said, “Can you come out tomorrow?” He said, “What about tonight?” I said, “With all 3 of us?” He replied, “Yes, at 8.00pm.” That was a bit late, so we arranged for 7.00pm. But, I went round Julie’s for tea and we didn’t get back round my house until 8.00pm. I love him madly. Hello me old mateys ! Derek apparently didn’t go last night either, because Sue and Me rung him up tonight. I don’t reckon he likes us, because he keeps making excuses as to why he doesn’t want to come out. I still luv him madly. Paul S’s Dad has been round all evening. He’s just gone (10.50pm) Rather late, don’t you think? My Dad’s hoping to move on the 28 th June. Eighteen days in this dud old house. I’ll really be sad when I have to leave all my old boyfriends, especially Derek. Hi ya ! I’ve had the greatest night ever. You see, me and Sue went to Elm Park tonight and we rang Derek up to see if he’d come to Elm Park on his bike. And he said he would. So, him and his mate came on their bikes. We went over Harrow Lodge Park. It was dead silence all the way, but I’m really glad. You see, Derek was riding next to me all the way. Anyway, it was 8.45pm and Me & Sue had to be back at 9. So we got back into Elm Park. Derek’s friend told us that they had to “shoot off”. Derek just went on ahead and didn’t even say “goodbye”. His mate did though. Watcha. Sue wasn’t allowed out tonight, because of last night. So I went out with Julie S. Anyway, we came back to my house and wrote 2 letters to Sue from Chris & Richard. (2 boys in our class). They put that they wanted to go out with her and would she go? Me and Julie went round her house at 8.30pm and Julie put them through the letter-box. Sue’s Mum and Dad are gonna do their nut. Never mind. Derek hasn’t come out tonight. Shame! Hi there, “Top of the Pops” was on tonight. This is who was on : Ray Stevens, Show Waddy Waddy, Gary Glitter, Neil Reid, Arrows. There’s 6 more stars who were on, but I’ve forgotten who they were. (Silly cow). Marie and Susan watched it round my house. So did Measy’s (Marie’s) dog, Mark. He’s a little grey toy-poodle. Measy reckoned she’d walked out on her Mum & Dad. This is what she brought with her: Her sheepskin coat, her dog, Mark, and £27.50 in money. For a punishment of not telling her Mum where she was going, Marie’s got to stay in all week, not watch any football. Aah! Andrew from the campsite came over with his Mum and Dad tonight. We took him to see this old ruined cottage on the Southend Road. It weren’t half scary. Dear Me, We went to a really great wedding tonight! It was my Mum’s cousin, Graham, who got married to a girl called Linda. There was a disco there, but they played quite a few dud, old-fashioned records. Jimmy, my hero, was there. You know, my Mum’s other cousin, who’s a sailor. I got a kiss goodbye from him. The “Partridge Family” was on the telly this morning. It is the first series that was on and David Cassidy had really short hair. I thought it looked really nice. Watcha , Me. We went down to the garden of our new house in Rayleigh today. Mum, on Friday, aid that I could bring a friend with me, so I asked Susan. But, her Mum and Dad wouldn’t let her come, in case we got back about 10 or 11 o’clock. So, this morning, I rang Julie S. up. She was allowed to come. It was really a good day. We explored all the shops and guess what? We went past this boy’s house who used to be in my class. His name’s Mark W. He fancied me and I fancied him. Nice! Hello! It was Monday today and so we went to school. “It’s a Knockout” was held for the 2 nd Year and Me, Marie, Lynne N. and Julie C. was in it. We had to partner up with the boys. My teacher made me go with Stuart T, Marie with Colin B, (Lucky cow, she had to hold his hand all through one game) Julie C. with Raymond S. and Lynne with David R. It was a right laugh. We came 2 nd overall. Tonight, we rang Derek up and told him to stand at his front window, because Christine didn’t believe in him. He did! And I really love him. Hi. “Top 20” was on today and Gary Glitter is no. 1. I’m really pleased for him. We’ve found this little baby sparrow tonight, but we can’t tell what’s wrong with it. At the moment, it’s in the shed, in a basket with lots of grass. Hope it doesn’t die for the morning. Hello! You know that (as you can see my pen’s run out) little sparrow, well we went to the shed this morning and he was still alive. BUT, here comes the sad news. When I got home today, it was dead. It died when my sister was with it. At school this afternoon, I was doubled up with pain in my stomach. So, until 2.30pm I was in the medical room and then Miss Laurence sent for my Mum who picked me up. I’m not going to school tomorrow either. Went and took our other car down to our new house tonight. Only one week to go. Dear Me, Like the flash green pen? Smart, ain’t it? “Top of the Pops” is on in 5 minutes (7.10). I’m going to write them down as they come on, otherwise I usually forget who’s been on. Here they are: Gary Glitter (I’m cheating. I’ve filled that one in coz he’s no. 1.) Anyway, on the telly they’ve just announced that they can’t show “Top of the Pops”, so instead we’ve got “Dad’s Army”. Stupid telly people. I’ll have to get a kiss from Derek B. before I move, otherwise I’ll go mad! Hi ! I broke the news to Smelly Dee today about moving. He seemed quite disappointed. Ha! Ha! Ha! What with Christine H. going back to Canada today and me leaving on Tuesday. Well ! Susan (silly old Bat) broke up with me. You see, Julie was sitting on her own and so I said to Sue, “Let’s go and sit with Julie”. I got over there (it was a big row of desks like this: /Boy/–/–/–/Me/Julie/). Susan come up and coz I was sitting next to Julie, she said in a snotty voice, “Alright, if you don’t want me to sit with you, I won’t!” And she stormed off to the other side of the classroom. I’m not bothering to make up now! Watcha, Got up at 9.20am, had breakfast, went shopping and then we went down to Rayleigh for the day. My Dad was fixing up curtain rails and my Mum put the curtains up. Then we put a square of carpet down in the lounge. We later moved on to the campsite. I’ve got really sad news. Ray’s Mum, Grace, died on Thursday. She’s only young as well. I still go craze on Lee. If only, yes, if only he liked me enough to go out with me. Dear Me, I’ve only got tonight, tomorrow night and Tuesday night left in this house. I’m feeling rather sad, but I think I’ll settle down quite well in Rayleigh. If I don’t, I’ve got quite a good idea up my sleeve. You see, if I don’t like the school, I might get my Mum to let me travel to Abbs X every day with Toni. (Just a brainwave). It’s 9.10pm. I’m waiting to go and have my bath, but my sister’s just got in there. Our complete house is nearly packed in boxes. My Mum and Dad have just finished carrying some of it out to the garage. Dear Me, It’s Monday night. Yes, there’s only tonight and tomorrow night left. I’ve only got tomorrow left at Abbs X. (Great! Mind you, I’m gonna be pretty sad at leaving all my mates, even though Sue broke up with me). By the way, Sue asked to make up today, but I said, “No”. It really shocked her, because I usually give in easy, but this time I’m not! It’s only 9.25pm. It’s still light outside and I’m going to get undressed and get into bed. Watcha! The time’s finally come! Yes. It’s my last night in this house. I came home after going around with Measy & Sue (she made up with me) and found out that my Nan was actually gonna sleep in my bed. That really got me going. You see, when we first moved here, I didn’t sleep in my bedroom for the first night and now, I wasn’t allowed for the last night. So, I told my Mum and now revor’s sleeping on the settee and I’m in my own bed. Measy rang Derek up tonight and asked him to come out and say goodbye to me, but he didn’t come out. Hi, We’ve moved into our new house. It’s great, but no lights work upstairs. So, at the moment, me and Toni are in our bedroom with candles as a light. It pelted all day with rain and everything got spoilt more than it should have. Our new suite (settee etc.) got ripped on the journey. I was a bit sad to leave all my friends, but it still doesn’t seem to have affected me! 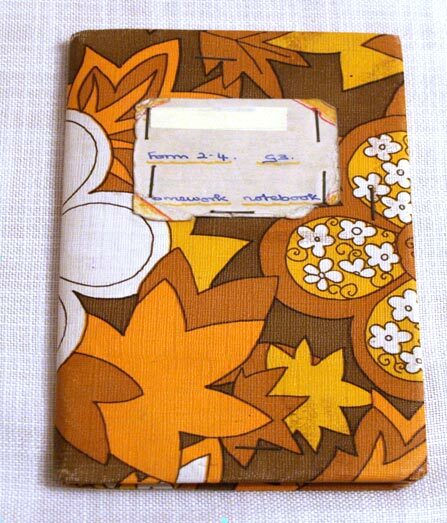 I’m gonna write o Susan tomorrow, even though on our 2 nd journey back to Rainham, I told her I’d write it tonight. Dear Me, It’s been quite a good day. The lounge and dining room carpet has been fitted and everything is straight there. The hall is quite tidy, but there’s no carpets yet. In Toni’s and my bedroom, it looks comfy because we’ve got a big square of carpet on the floor. My Mum and Dad’s room has got everything in it and Trev’s is alright. It’s 10.20pm and just now there was a man on his front lawn in a red tracksuit doing exercises. It as quite funny. We were sitting in next door’s with the boys and all the lights were fused. Dear Me, It’s been quite a good day. This morning, I went to my new school to see if I could go there. They said “Yes”, so I’m starting on Monday. It looks really nice inside. All evening, I’ve been playing badminton with Trevor and the boy next door, Martin. It was very funny! Tomorrow’s Saturday. Great! It’s 10.10pm and I’m just in our bedroom, even though I’m not going to go to bed yet. It’s 12.04pm (or is it a.m? One or the other!) I’m laying on my bed just writing this diary. Downstairs, Mum & Dad, Peggy & Edwin and Martin are all sitting chatting. They’ve just come home from the pub, bringing Chinese with them. P.S. The boy next door- but- one is Terry J’s cousin and Toddy’s! Dear Me, It’s been a good day today! I rang Julie S. up and she was telling me all the news back in Hornchurch. On Friday, all my old class went to a dance and Julie said that Bobby and Derek B. were there. She said Kim had a cousin who kept going up and talking to MY Derek. I’ll never forget him for as long as I live. It’s school for me tomorrow. I’m rather excited! Martin’s Dad is giving me a lift in his car. Martin’s Mum treats me like a little kid though. 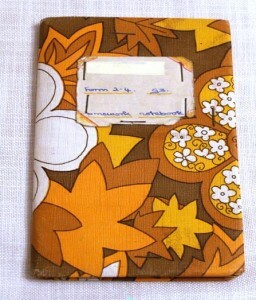 Did anyone else cover their homework diaries in orange wallpaper? 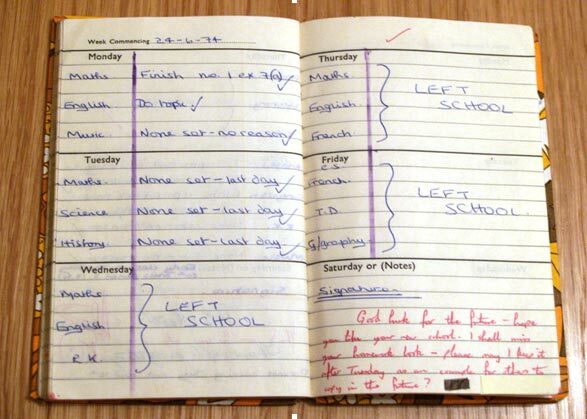 Note: My form teacher asked to keep this when I left the school in 1974, as an example of neatness for future pupils. It was returned to me 28 years later in 2002 by the same teacher at a school reunion! !